William Foster Blackinton was born May 25, 1922, in Acequia, Idaho, to Ruby Clark and Emmett Reynolds Blackinton. Acequia is a little town located a few miles from Rupert in the lower southwest portion of Idaho. His parents had moved up from Ogden, Utah, to try their hand at farming and to work on the construction of the Minidoka Dam. After the dam was completed, the family moved back to Ogden when he was one year old. Bill had four sisters and was the second to the last child born. He was named after his two grandfathers: William Henry Clark and Foster Emmett Blackinton. His sisters were Eva Bea, born December 17, 1917 and died December 29, 1917 in Acequia; Helen Jean (Joseph James Clausse) born April 13, 1919 in Acequia; Betty Lou (George Stanley Fridberg) born August 20, 1920 in Acequia; and Marion, born April 26, 1928 in Ogden, Utah. Bill skipped either the 2nd or 3rd grade in school so be graduated from Weber County High School with his diploma in Ogden a year early in 1939. He worked at Blackinton and Son Canning Company in Ogden which was founded by his father in 1940. He worked there until the joined the military in 1942. Bill married Phyllis Rickerson, his high school sweetheart, on October 8, 1940 at the age of 18 years in Devil's Slide, Morgan, Utah. There were no children of this marriage. Bill was like a modern-day Tom Sawyer, very easy going and well liked by everyone. When he was growing up and there were chores for him to do, he could always talk his friends into doing his work while he supervised the operation. His littlest sister, Marion, remembered Bill taking her to school on her very first day of kindergarten. She was so scared and wouldn't leave her big brother, so Bill ended up having his kid sister follow him around that first day. Also when she was around, he wouldn't let any of his friends swear. Bill had a motorcycle which he loved to ride. 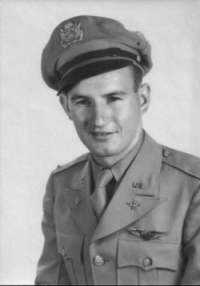 Bill enlisted in the Army Air Corps in late 1942. His father drove him to San Francisco to see him off. He was the last to see him and he had a "feeling" that would be the last time he would see him.